The new 9/11 Memorial Museum is an underground museum located in the heart of ground zero directly beneath the memorial and where the towers collapsed. The museum will house genuine artifacts such as the "survivor staircase", a fire engine that honors the first responders and the famous last column, (the final massive remnant of the towers to be removed). Also a large projection on the wall will show the morning of 9/11 as it played out in the air. At the center of the 9/11 Memorial Plaza in NYC are two giant cascading pools -- twin voids set into the footprints where the towers of the World Trade Center once stood. Each pool is surrounded by 2,983 names -- the victims of terrorism from the Twin Towers, The Pentagon, Pennsylvania's Shanksville and the 1993 WTC Bombings. 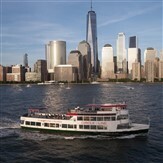 Enjoy New York Citys most famous landmarks on the Hudson and East River, as well as incredible views of Manhattans downtown skyline with Circle Line Sightseeing Cruises. A buffet style meal is included.